We’ve all been there as moms, frazzled, tired and plain ol’ worn out. We can’t focus nor see past the circumstances before us. We turn to the left and to the right for advice from trusted sources only to realize their well-meaning intentions were just not for you, your marriage, your kids, and where you are in your momma life! We begin to hide away, sink into darkness, feeling convicted or judged by every, “You need to do this”, “You must do that”, “I guarantee if you do this or did this better,” ahhh!!! And you wonder, are they really listening, do they hear your hearts plea? More often than not (myself included), the advice given or received is out of pride and a chance to elevate the very things deemed the “right way” in their eyes. This brings on feelings of condemnation to the very person who just needed a true listening ear, encouragement and a helping hand. In reading the book of Job, I find his plight very similar to ours today, not just as moms, but everyone. We see at the beginning of Job, blue skies as he walked in obedience, had complete integrity in all areas of his life and lived in abundance. He did everything considered right in the eyes of the Lord and yet his blue skies turned grey in an instant. Everything taken from him, including his children, livestock, even his health. We find him outside the city gates lamenting about his current state of affairs when three of his close friends come to “encourage” and sit with their dear friend. In the conversations that follow between them, we see a resemblance in our conversations today when seeking encouragement amidst pain and strife. Job claimed his innocence before his friends and knew he had not sinned nor deserved the heavy weight placed upon him. However, his friends concluded he must have sinned for this great punishment allotted to him. They didn’t listen to Job or his pleas and insisted he admit his sin which would have been a false confession. Their words were empty and disregarded his faithfulness to the Lord. They focused instead on the seen: his suffering and circumstances played out before him. We seem to think sin is the failsafe switch that applies to all life’s struggles but as we read through the context of Job we find that isn’t always true. Yes, we each sin, but the circumstances in our lives that unfold are not automatically a direct result of them. In our efforts to point out sin in the lives of others not doing as we do or saying as we say, we are failing to realize each marriage, child, and mom are different. We are not carbon copies of each other and what works for one family does not work for another even if the struggles may look the same. It goes the opposite way too. A friend may have insight into a struggle directly related to another person’s sin and they may truly see and hear their heart. They approach out of love to give wisdom and a helping hand but are met with rejection because we perceive them as judging us, right? This may not be the case at all! Conviction comes when someone sees truth and reveals it. We, as humans feel unsafe after someone sees our sin and rather than welcoming the helping hand, we bite it in fear, and rush to hide behind the curtain claiming their judgment of us. 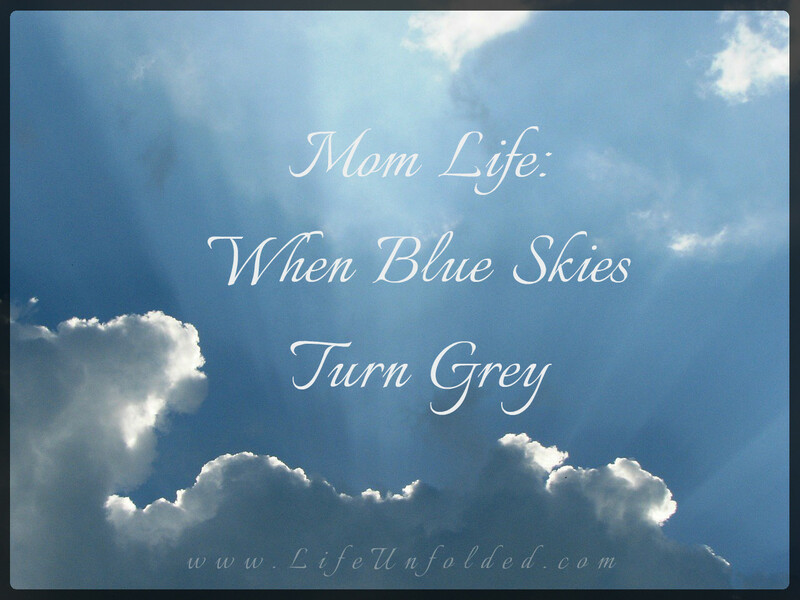 So, I ask, Momma, when blue skies turn grey, what do you do? Do you run to the many articles that list out how you should parent, how to make your marriage thrive only to leave you saying, “I did all of that and it didn’t work.” Do you cling to the advice of friends and married couples you admire, doing as they do and saying what they say, believing what works for them will work for you? Do you hide behind the façade of worldly truth claiming judgment biting those who see, hear your hearts plea and have experienced the very pain or circumstance you are currently walking and want to help? I know I have done each of the above. Or do you do the easiest thing yet is also the hardest to do: let go of what others do and say and instead hand things over to the One who truly knows all and place it in His ever capable hands? In Job, what his friends said was correct about the nature of God and how He deals with us, however they misused it in the situation at hand. We can’t just brush off the words or intent of these articles or our friends and label them false or misleading as many are correct in the teachings of the Lord. They are simply misused in the context of your situation, just as with Job. More often than not, we don’t want to be counseled out of fear or great pride but we must humble ourselves to truth and be willing to reflect upon ourselves. (Proverbs 16:20) We must realize not all trials come by the hand of others nor are they always God’s punishment against us but they could be something totally brought on by our own selves. In our reflection, we should also ask; Are we seeking those who will give us a pass on our sin helping us live comfortably in them or are we seeking real truth and help to guide us on a journey of healing and redemption? If not, then we are seeking the wrong kind of encouragement and truth. Job acted as anyone of us would in the given situation. What I find most intriguing about Job was he never gave up! He never turned his back on God! He did not accept the things his friends said he must have done to deserve the “punishment” he was incurring as truth. Sometimes the very things we think are God’s punishment or God turning his back on us are the very things He uses to grow our faith, give us strength, and teach us perseverance. Those are not bad things! (James 5:11) Mommas don’t give up! He sees you, He knows you, and loves you more than you can ever imagine. Don’t accept the thoughts and opinions of others as truth and turn your back on the One who loves you wholly and completely! Don’t be tossed about between the waves of information overload that doesn’t compute with who you are as a person in Christ! He carries you, gives you wisdom, discernment and intercedes on your behalf. (Proverbs 2:1-8, Romans 8:25-27) Don’t let the comparison trap ensnare you or cause confusion in choosing what is best for you and your family. Surrender to the King of Kings; seek His will and way for your family. More often than not, saying no or letting go of something that doesn’t give life any longer, gives you the opportunity to say a more important yes to something even better. Proverbs 20:24 says, “The Lord directs your steps, so why try to understand everything along the way.” I love the study text with this verse as it says, “We do not need to understand why things happen, but we should not lose hope, for God is in control.” Love that!!! Let Holy Spirit lead you when you don’t understand what is happening or whether to turn from the left or to the right from all the well-meaning advice given, look up! (Proverbs 3:5-6) Sit at the feet of the Wonderful Counselor and seek wisdom from the One who authored and created it. He doesn’t want you to focus on the circumstances of life or your sin, but on Him! He’s got your back! Trust Him to give you the clarity and discernment needed in your life and the life of your family! Thank you for sharing these needed reminders. You are blessed with a gift! Keep writing!! Thank you for your kind words and encouragment!